EID recently reported being pleasantly surprised to see a Jefferson County well top the Ohio Department of Natural Resource’s (ODNR) list of the Buckeye State’s top producing natural gas wells for the fourth quarter of 2016. 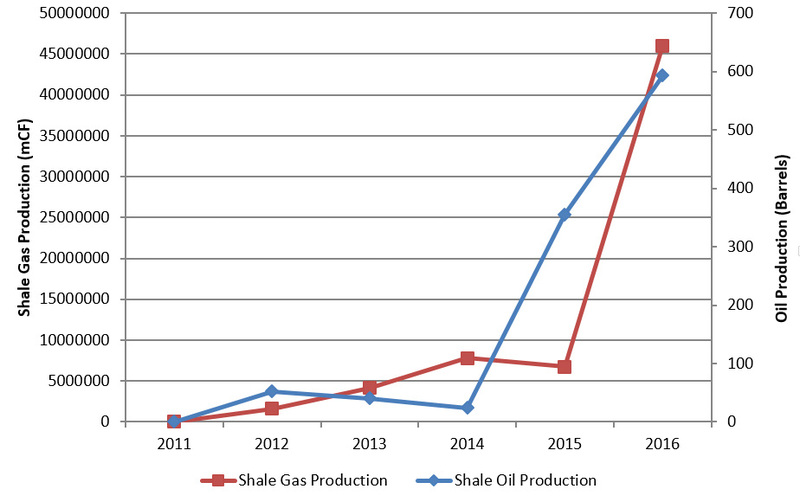 This recent news prompted us to take a closer look at the county’s Utica Shale production and ad valorem taxes paid on production in anticipation of what could be some promising days ahead for Jefferson County. Our research found that since 2011, real estate property taxes from oil and gas production went from practically nothing to better than $200,000 per year for the county. What’s more impressive is the fact that natural gas production grew by 587 percent from 2015 to 2016, which means that the county can expect to see a surge of new tax revenue as well. This is great news for schools and local governments, where 100 percent of these taxes are allocated. 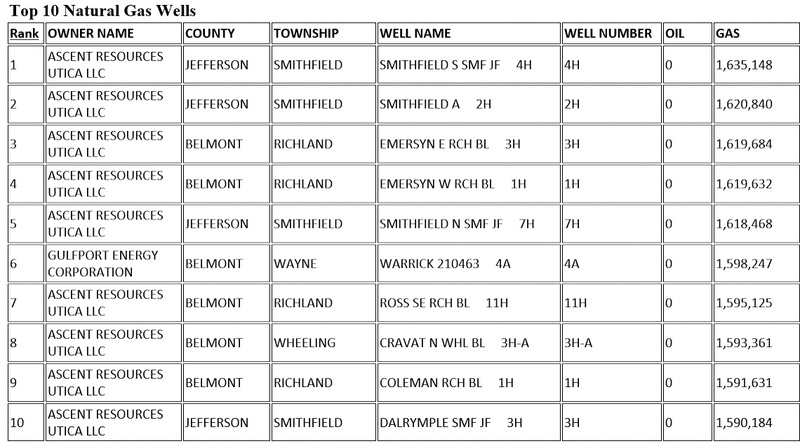 When Jefferson County’s first Utica Shale well went into production back in 2012, the county had the fourth-most drilling permits in Ohio (25 permits) and was home to the one of the highest producing wells in the state. The Brown 10H well achieved a peak rate of approximately 1,445 barrels of oil equivalent per day five years ago, which included 8.7 million cubic feet (mcf) of natural gas per day. At the time, this was considered to be a good well. However, drilling and production slowed considerably in the county soon after, and as a result, Jefferson County was not a top natural gas producing county for quite some time. But fourth quarter 2016 data indicates this trend might be changing, as Jefferson County had the top two producing natural gas wells in the state during that time period. With 103 Utica Shale wells in various stages of activity in Jefferson County today — including 20 wells permitted, 18 that are being drilled, 30 that are drilled and 35 that are producing — the fourth quarter of 2016 yielded record highs for natural gas production in the county where six oil and gas operators currently have permits. 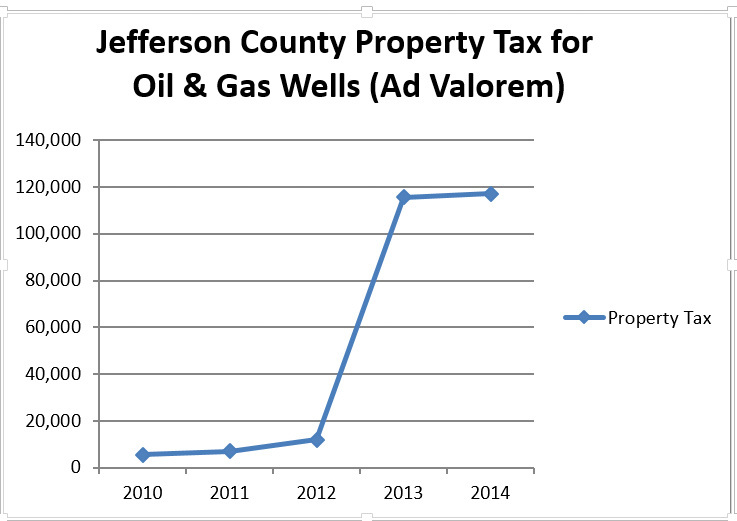 Here’s the breakdown of the ad valorem tax payment received to the county from 2011 to 2016. The receipts do not account for the surge in production last year, as those taxes are not yet due. If 2016’s encouraging production and the current uptick in drilling permits are any indicator of things to come, it’s likely that the hundreds of thousands of dollars in real estate property taxes from production being collected in Jefferson County could soon swell to over a million dollars or more per year, as other Ohio counties have realized. In fact, Ohio counties have collectively received more $45 million from this one tax! In conclusion, we would encourage watching Jefferson County. With a surge of natural gas production rising over 587 percent, it’s certainly a Utica County to watch!